But kids amass stuff no matter how hard you try to avoid it. Puzzles and action figures and five million tiny legos. And little plastic toys from happy meals and musical instruments and samurai castles. And cars and books and stuffed toys and train sets. And a toy kitchen, a toy workbench, and something called bonkazonks. And coloring books, sticker collections, broken crayons, and cowboy hats. And I’m also to blame for our accumulation of stuff. Because I need matching dishes and glasses. And I needed a sombrero for my Mexican fiesta (which will now live in the basement just in case I want to throw another fiesta). And we couldn’t possibly have had a lemonade stand without a proper lemonade dispenser. And my life wouldn’t be complete without those little metal nest candleholders and turquoise birdie candles. It all seemed so important at the time, but now it achieves nothing besides making me feel claustrophobic in my own home. I don’t even want to think about the paperwork we collect. Bills and important forms and certificates. A million pages of important paper to file and save, just in case. Just in case. How in the world did complicated and cluttered become the norm of our existence? It takes actual effort to not accumulate stuff and not to feed into the expectations we’ve grown to have about what we need. Certainly, those brightly colored, beautifully photographed magazines from Pottery Barn and Anthropologie aren’t doing anything to help limit my stuff accumulation. I know, I know…waa, waa, waa, I have too much stuff. Talk about a first world problem! Believe me, I don’t take it for granted. I just think that our well-intentioned culture has a tendency to overcomplicate life to the point of chaos. I want to simplify. Let go of clutter. Live in an environment of minimalistic zen. Focus on what’s important. And so this is the summer of the purge! I’m moving from room to room and closet to closet to eliminate the clutter. We’ll hold a garage sale to sell what we can, then donate the rest. Goodbye handheld carpet cleaner I’ve never used. Goodbye racks and racks of dvds we will probably never watch. Goodbye duplicate copies #2, #3, and #4 of The Giving Tree. I love you, but we only need one of you. Goodbye all three 50 Shades of Grey books. You weren’t worth the time it took to read you. May you live happily in someone else’s home. And goodbye wine rack. I drink my wine way too fast to ever put you to use. My minimalistic impulses carry over into my feelings about food. I like simple fresh flavors, short ingredient lists, and uncomplicated preparation methods. I’m totally intrigued by the whole arena of molecular gastronomy…gelification, spherification, foamification and whatnot(ification). I want to eat that food and marvel over the cleverness of the chef. But my personal approach to food is much simpler. No fancy tools, no futuristic techniques…just a sharp knife, a few simple tools, and a good set of pots and pans. It’s really all you need. 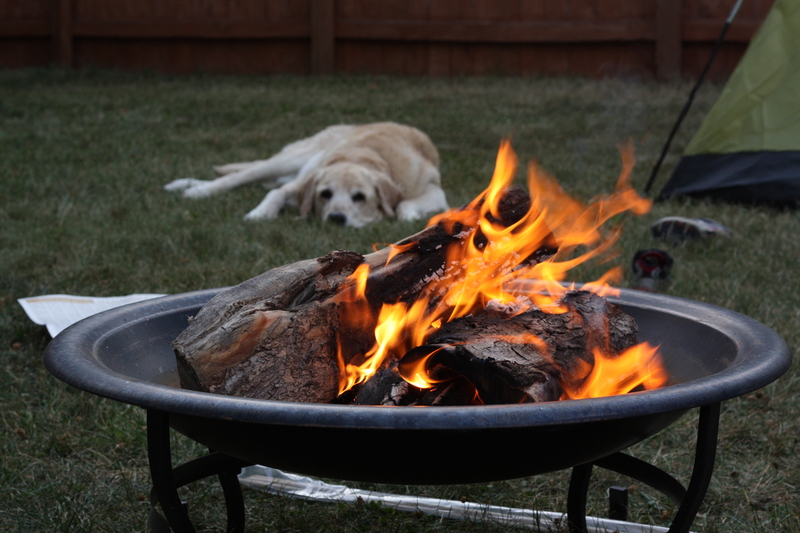 A few nights ago, my husband and the boys pitched a tent in the backyard for a summer campout. 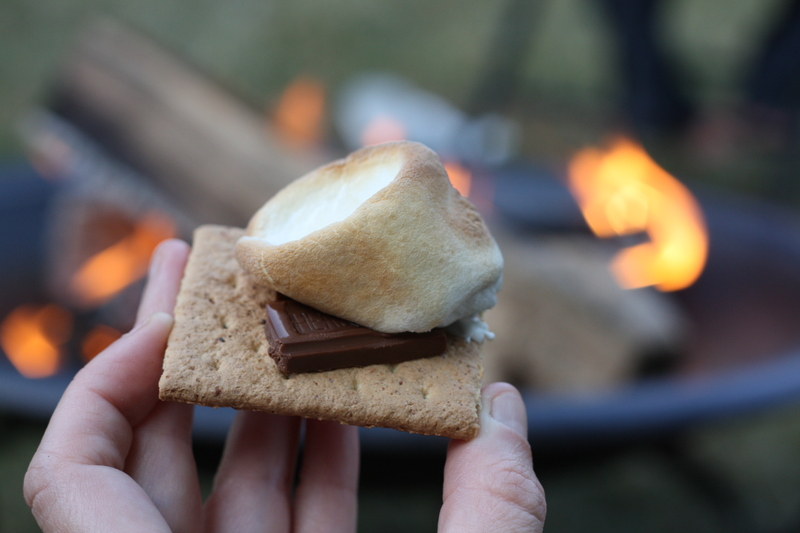 They built a fire and we roasted marshmallows, which we layered with chocolate and graham crackers for a classic s’mores treat. The boys entertained us with campfire songs and spooky stories involving mommy and daddy getting eaten by a sasquatch. 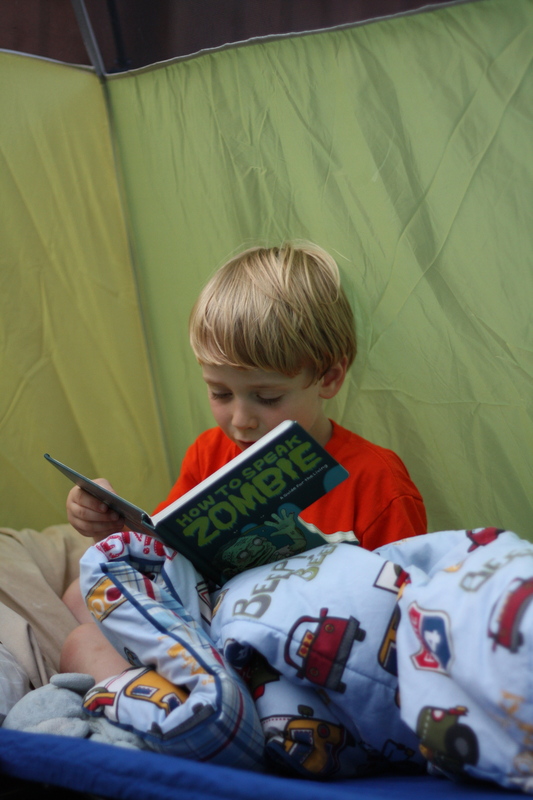 And then they snuggled up in the tent and slept the night away. It was an idealistic evening. It’s the simple things in life, isn’t it? But a few days earlier in the week, the boys had a craving for s’mores. So I came up with these little individual s’mores pudding cups…for those nights when you don’t have a marshmallow roastin’ fire roaring in the backyard. Rich, homemade chocolate pudding gets layered with mini marshmallows and crumbled graham crackers. Nothing fancy, but what a crowd-pleaser! Simple pleasures. 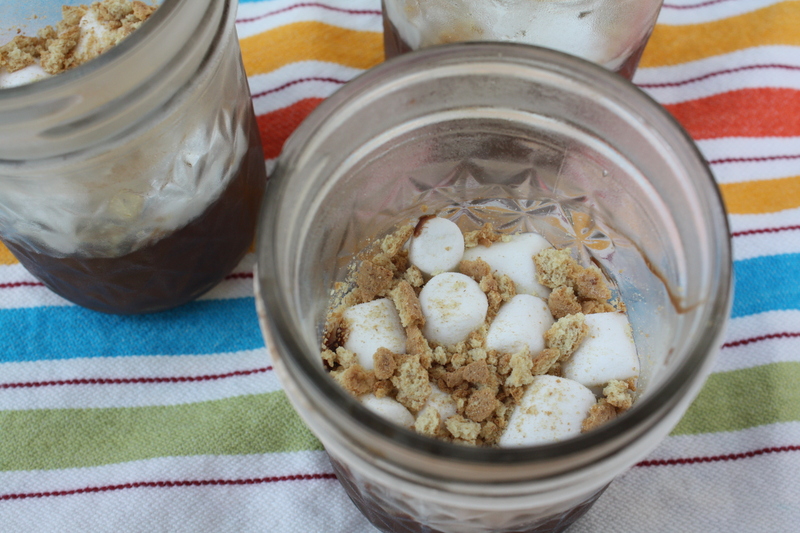 Sprinkle about half of the graham cracker crumbs and half of the marshmallows onto the bottom of six individual serving bowls or glasses. Reserve the remaining crumbs and marshmallows. In a saucepan, mix together sugar, cornstarch, cocoa, and salt. Whisk in the milk, stirring until combined. Continue whisking over medium heat until the mixture begins to bubble and thicken, about 5 minutes. Whisking constantly, continue cooking for another minute or two. Be careful to whisk into the corners and along the sides of the pan. Remove from heat. Whisk in the chocolate chips and vanilla, stirring until fully melted. 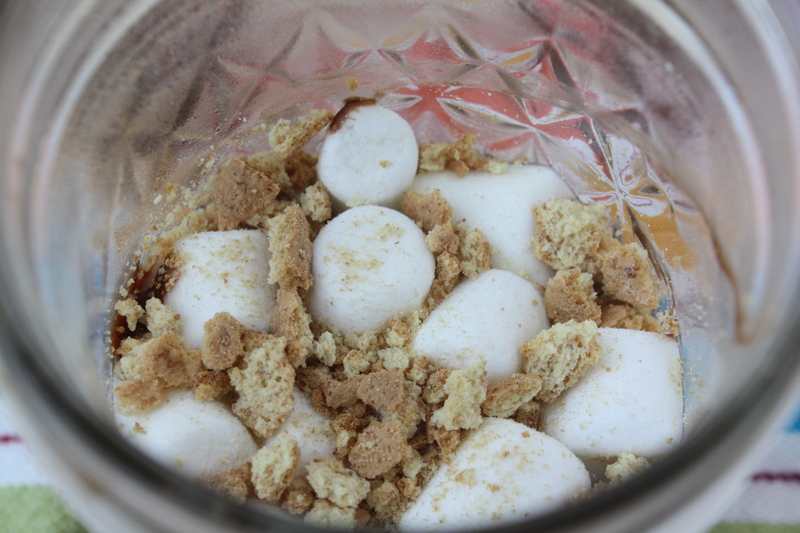 Carefully pour the hot pudding over the marshmallows and graham cracker crumbs. While the pudding is still hot, scatter the remaining marshmallows over the top and sprinkle with the remaining graham cracker crumbs. Refrigerate until chilled. Posted in Chocolate, Desserts, Food, Recipes and tagged camping, chocolate, Cooking, dessert, Eating, family, Food, kids, life, love, parenting, Recipes, s'mores, summer. Bookmark the permalink. I could not agree more with your blog. It’s so easy to collect! I too want to de-clutter. My biggest obstacle is that “as soon as I get rid of it, we’ll need it”…. but will we really? Maybe time will tell. Thanks for your posts and yummy recipes. 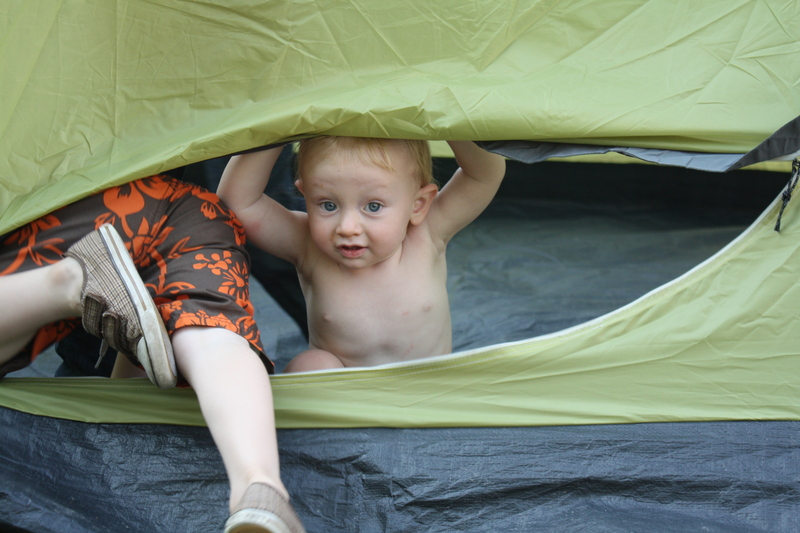 Such a wonderful message – truly – but I can’t take my eyes off the adorable first photo of your son peeking out of the tent! Sign me up for simple pleasures! 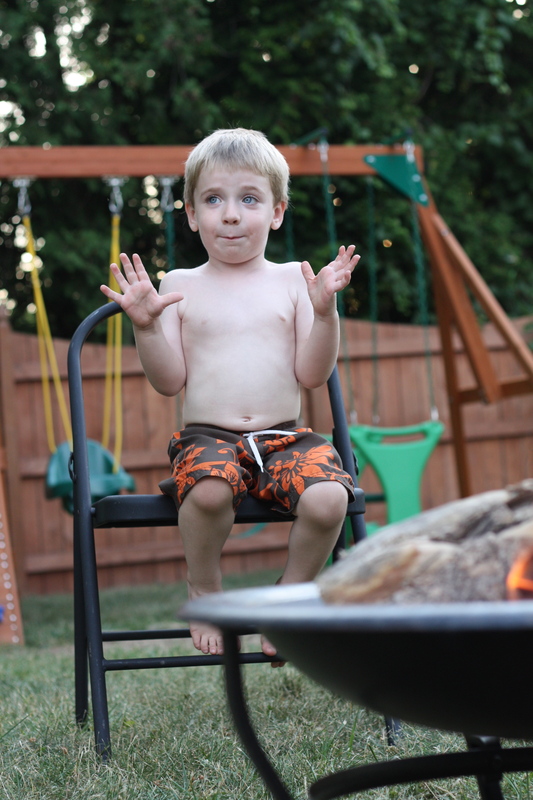 I love the pics of your kids and the campfire!